I’m obsessed with food. I think that’s pretty clear. Even when I’m eating, I’m thinking about my next meal. I’ll be full to bursting but if someone waves a dessert in front of me, I’ll be hard-pressed to turn it down (read: I will never turn it down). To fuel my fixation with food, I troll food websites like nobody’s business. I used to read a lot of local foodie blogs where the blogger would go and critique restaurants. I’d sit at my desk and drool over the succession of up close, detailed, hunger-inducing photos of each dish ordered by the writer. Nowadays, I tend to mainly visit baking and cooking blogs, especially those with stunning photography and witty, intelligent writing. Needless to say, there is a staggering amount of them out there. One of the blogs I’ve recently had the pleasure of discovering is Juanita’s Cocina. She’s an intelligent, feisty lady with a talent for choosing and creating innovative dishes alongside comforting classics. See her post regarding the Chik-Fil-A controversy here and you’ll understand I admire her so. She also blew my mind not so long ago with bacon chocolate chip cookies. Yes, you heard right – BACON. In chocolate chip cookies! Most people I know fall into two camps – those who think bacon should strictly be eaten as a savoury item and those who want to add it to every sweet dessert in existence. I fall comfortably in the middle – I enjoy bacon in all forms. I’ve had bacon in chocolate bars and bacon in donuts. I’ve yet to try bacon in cookies. This sorry state of existence was crying out to be rectified. What would take this over the top? Why, candied bacon of course. 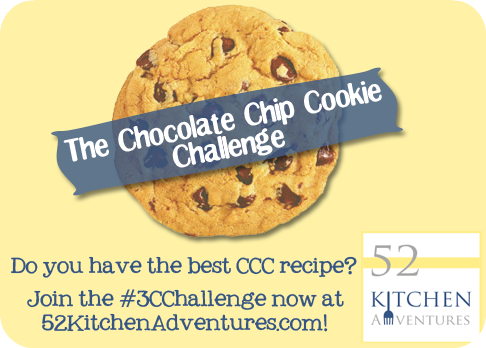 I knew this was the perfect cookie for 52 Kitchen Adventures’ Chocolate Chip Cookie Challenge. Ok, yeah, that’s just my excuse for baking these. Who am I kidding, right? Let’s start with the real star of the show. 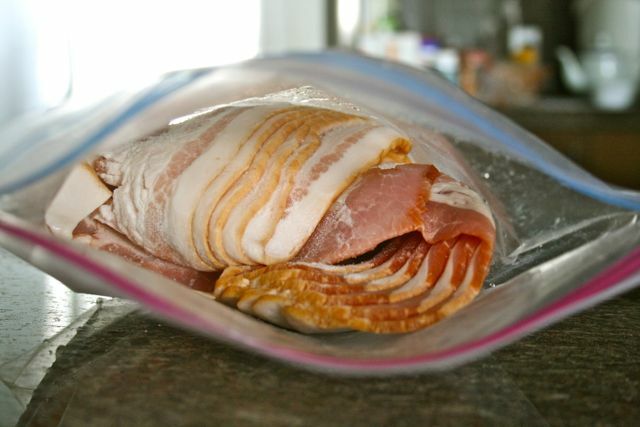 Defrosting my bacon. Melt faster dammit! All the recipes I consulted on the almighty interweb called for the same items in pretty much the same measurements: a ton of bacon and a ton of brown sugar. First I threw all my bacon into a bowl and dumped a crap load of brown sugar in. Measurements fly out the window here, people. I used a whole package of reduced salt bacon and totally eyeballed the brown sugar. I figured the more sugar the better and hot damn, was I right. I wasn’t getting maximum brown sugar coverage via the bowl method, so I filled a plate with brown sugar and hand dredged each slice (no photos – my hands were covered in bacon grease). Much better. Naturally, I sprinkled even more brown sugar over top of the slices. 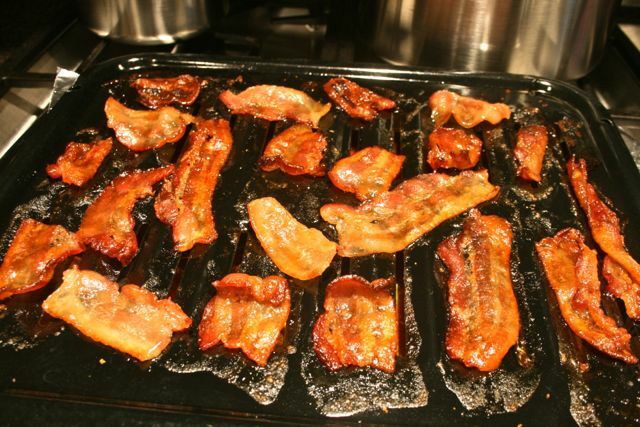 Use a broiler pan or a cooling rack on top of a baking sheet to bake your bacon (basically anything that’ll allow the bacon grease to drip down). This step is so important, people. I forgot to place a cooling rack on top of my baking sheet and had to transfer the bacon drowning in grease to my broiler pan halfway through baking. I had to bake my bacon for about half an hour. Watch yours carefully. You want them to crisp not burn. Get them to a nice brown colour. 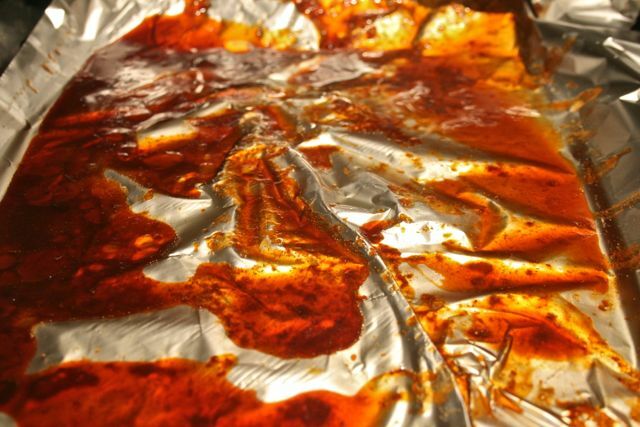 Even if they’re not fully crisp, (like little boards as it’s recommended online), don’t worry cause the caramelized brown sugar will harden when cooled. I put a piece in my mouth and had an out of body experience. Do you already think bacon is one of humankind’s most brilliant inventions? Just wait till you candy it. 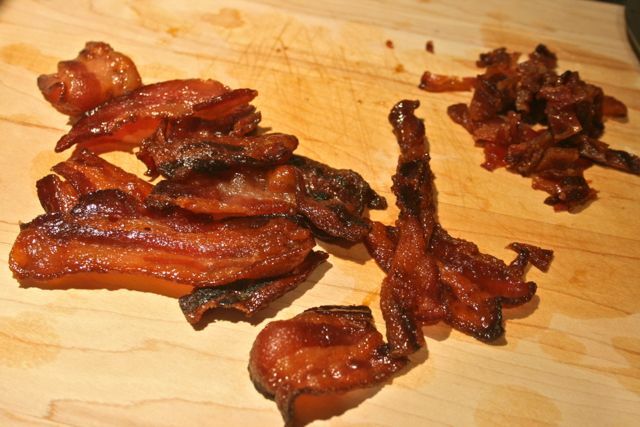 Check out all the sugary grease from the bacon. Drinking or eating it would be a bit TOO much, oui? You get that smoky, salty, meaty flavour of bacon with that tantalizing fatty crunch between the teeth and each piece is covered in a thick, crispy, chewy layer of caramelized brown sugar. I had to stop myself from eating more than one slice. After it’s cooled, chop it up into whatever size you want. Note: Juanita also made a maple syrup glaze for her cookies, which I omitted. If you want to take your cookies over the top, go to her post for the recipe. 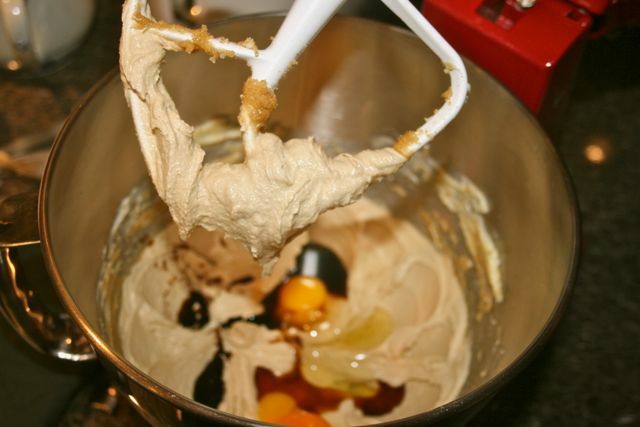 In a large bowl, using either a stand or hand mixer, cream together the butter and both sugars until fluffy. Add the eggs and vanilla and mix well. 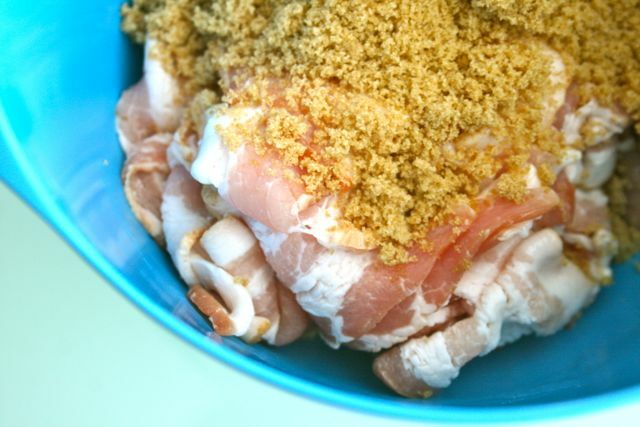 Add the dry ingredients into the wet in two batches, mixing thoroughly between each addition. Fold in the chocolate chips and the bacon until it’s all mixed up beautifully. Chill the dough for at least an hour before baking. I had mine in the fridge overnight since it was too late to bake after candying that bacon. Using a ¼ cup measuring spoon or a giant ice cream scoop as I did, spoon dough out into large mounds. 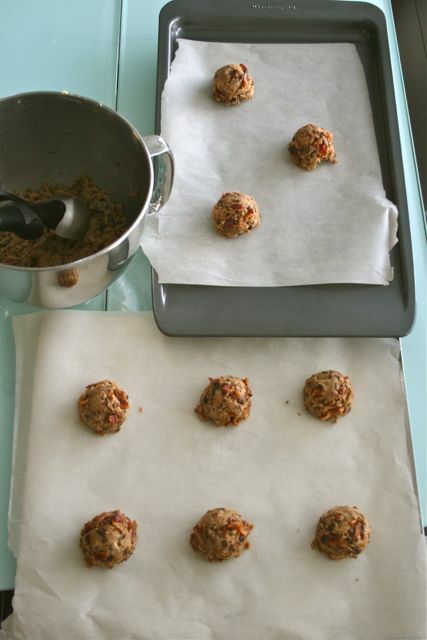 These will be big cookies – don’t overcrowd your cookie sheets (usually this means no more than 6 on a regular sized sheet). 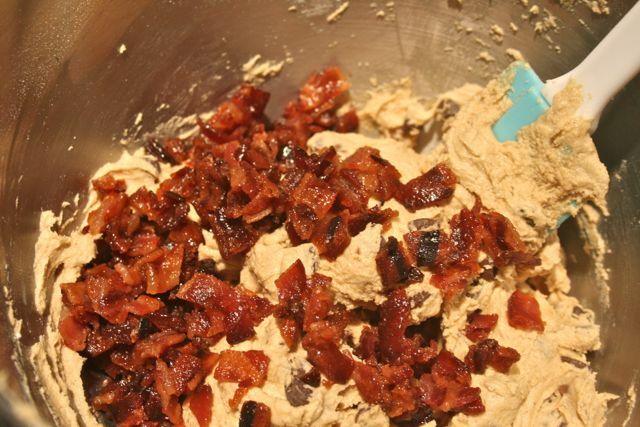 I then inserted even more bits of bacon into the tops of the cookies so that pieces would poke out of the finished product. Bake cookies for 13-15 minutes, until they just begin to brown on the edges. Don’t overbake, unless you like dry crunchy cookies. 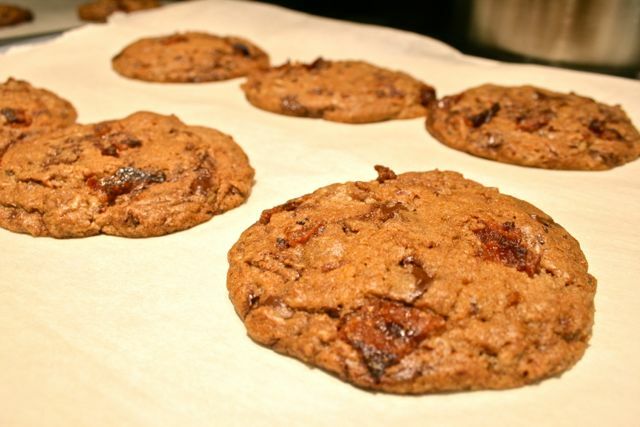 Leave cookies on the baking sheets for 5 minutes before moving them to a cooling rack. The only reason I didn’t immediately cram several smoking hot cookies into my ravenous mouth was because I was tackling a giant mountain of dirty dishes left over from two days of cooking and baking. The Husband ate one after they’d cooled for about 15 minutes and told me that there wasn’t much of a bacon flavour. Say what?! My heart just about stopped. 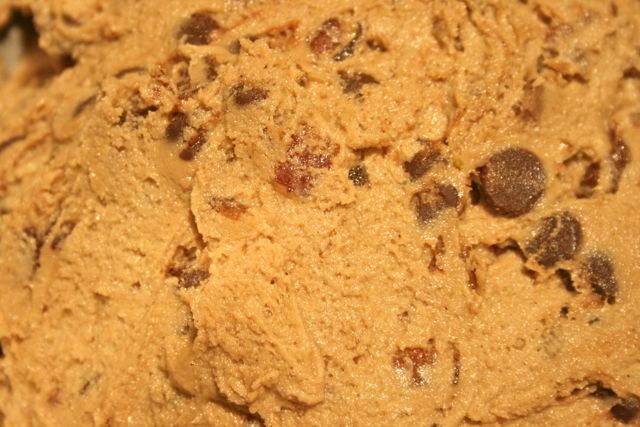 I put enough bacon in that cookie dough to call it Wilbur. We sampled another one and I was in hog heaven. This is seriously the best cookie I’ve ever made. 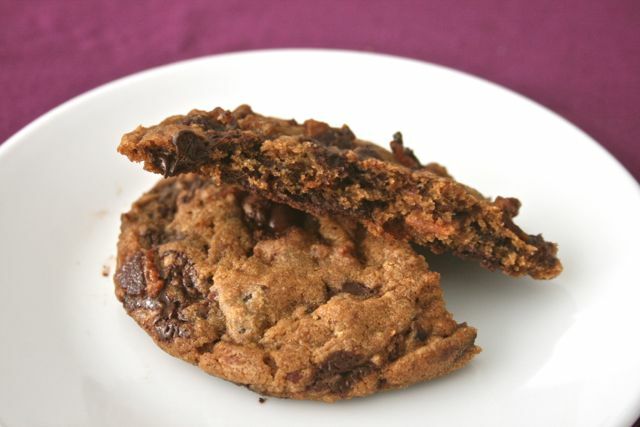 The cookie itself has the perfect texture that I’m looking for – it’s both satisfyingly crispy on the outside with a chewy inside. The candied bacon with that sweet brown sugar flavor encrusting the smoky, subtly salty meat definitely shines through and there’s a teeny tiny whisper of cinnamon rounding it all out. These cookies are NOT overly bacony if that’s your concern, nor do they taste or feel greasy. The combination of chocolate, brown sugar and bacon is a total winner. These are just as amazing the next day too. You will not regret for a single moment making these. Heart disease be damned! 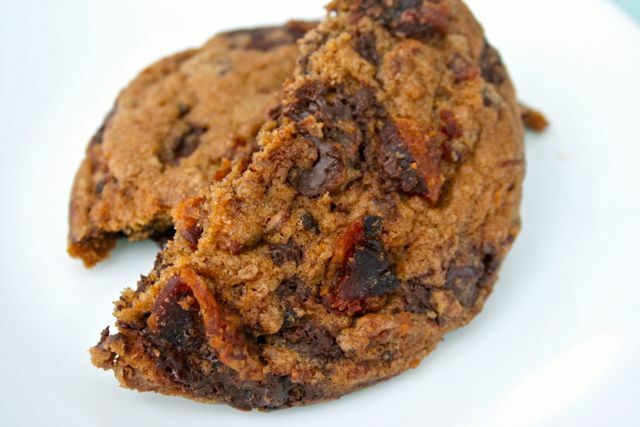 I love that this is the second cookie submitted to the Chocolate Chip Cookie Challenge link-up that has bacon! 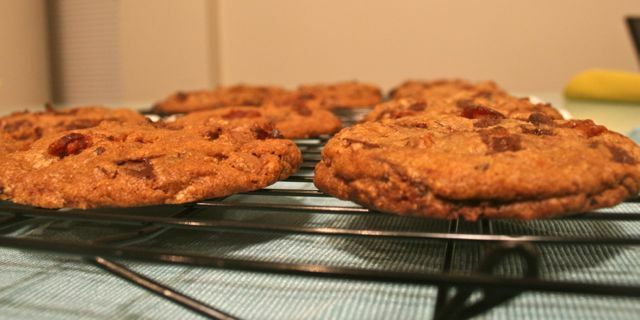 (Check out Simply Gourmet’s recipe: http://www.simply-gourmet.com/2012/06/156-my-everything-cookie.html). I’m in your camp – bacon is good both savory and sweet! Bacon is just delicious, why limit it? Candied bacon really does take this over the top. A couple of years ago I was on a mission to make the ultimate bacon chocolate cupcakes and tried out candied bacon for them – SO good. I ended up with chocolate covered bacon chips in the cake and bacon sprinkled on the frosting…mmm. 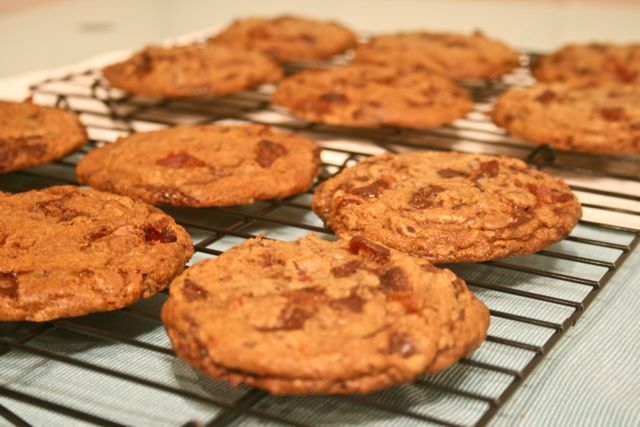 I’ll have to revisit that recipe when I buy bacon to try your cookies. Thanks for participating in the Chocolate Chip Cookie Challenge! I saw Simply Gourmet’s recipe earlier this afternoon. The repeat bacon CCC recipes just means that the combo is awesome! I really hope your chocolate bacon cupcakes are on your blog – that sounds amazing and totally something I would try. The CCC Challenge link-up was a lot of fun, thanks for putting it together! I recently saw someone post ccc’s with bacon that also had 1/2 cup bacon grease and 1/2 cup butter. Whoa. Would not be able to do that. But I do love the idea of trying it with candied bacon. Oh God, 1/2 cup bacon grease?! I kid when I say I want to drink/eat the stuff. That would make for one bacon-y, greasy cookie! I still have your CCC on my list of must-bake recipes and can’t wait to try them! I’m completely obsessed with food too- its a bit ridiculous.. Ive seen bacon in cookies and been a bit intimidated by it.. I mean bacon in cookies?! But you describe it and it sounds so good. I think I’m going to have to try it. I really like the end of the post ‘heart disease be damned’ haha 🙂 that made me laugh. I’m well on my way to type 2 diabetes and high cholesterol. I might as well eat good food on the way there! Seriously though, I can’t say enough good things about these cookies. You’ll love ’em! My son,a bacon expert,has been candying his own bacon for awhile,with maple syrup…now I’m going to use this yumminess in my baking,instead of just watching him eat..well tasting a bit,of course! Good for you, Lorraine! I say go for it! I can’t believe I’ve gone through my whole life without trying candied bacon. I’m glad I finally jumped on the bandwagon. I have to candy bacon. Like immediately. For my mental health! YUMMMMM! Lol thank you thank you! But you’re the entire reason why I even attempted this feat of amazingness in the first place. And seriously – candied bacon will change your life. It’s changed mine! I want to eat it everyday, with everything! OMG, these look delicious!!! bacon in a cookie? why the hell not? and candied bacon?! OMG, I am drooling all over my macbook air. . love it. can’t wait to try this recipe! So, the first cookie that “the husband” ate must have been the runt of the litter, eh? 🙂 love this post! omg – “runt of the litter” – amazing! I couldn’t stop laughing after I read that. Since we both loved that NYT CCC, I know that you’re going to love this one. Bacon truly does make everything better. Nancy! What are you doing to me? 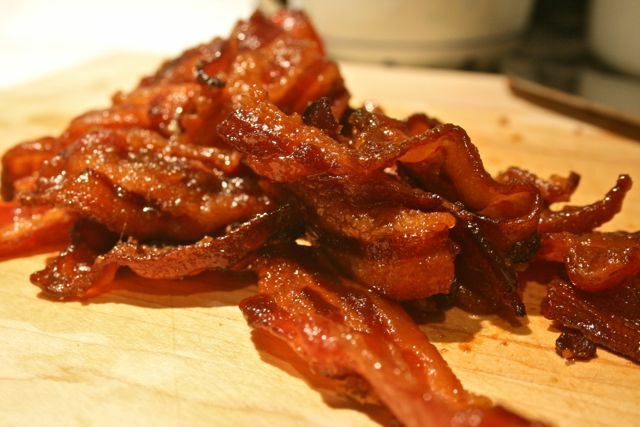 It’s only 9:15 am and now I have a serious craving for some of your candied bacon CCC and your making me hungry too. Oh. Ehm. Gee! 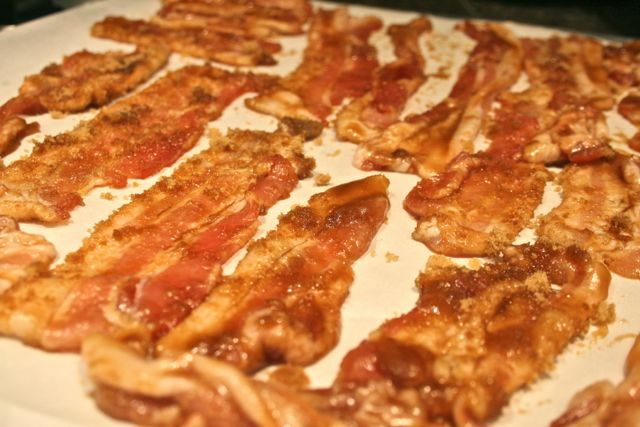 I’d write more … but I’m going to go make some candied bacon instead. I totally approve. Sometimes there just aren’t enough words. Oh no! 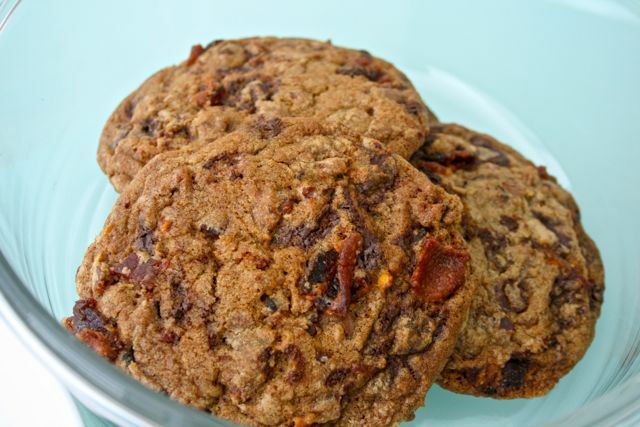 You’ve combined my two favorite food groups…chocolate chips and bacon. I can’t wait to make these…and keep them all for myself! You’re a smart woman, Mama. I only kept a few cookies and made the Husband bring the rest to work. Otherwise I would’ve eaten the entire batch myself! Now I’m kicking myself for that fool’s move. Thanks so much! You truly deserve the Inspiring Blog award with all the fabulous topics you cover. I’m honoured you passed it onto me. Let’s see how long it takes me to accept and blog about it! Take your time I know its very time consuming! 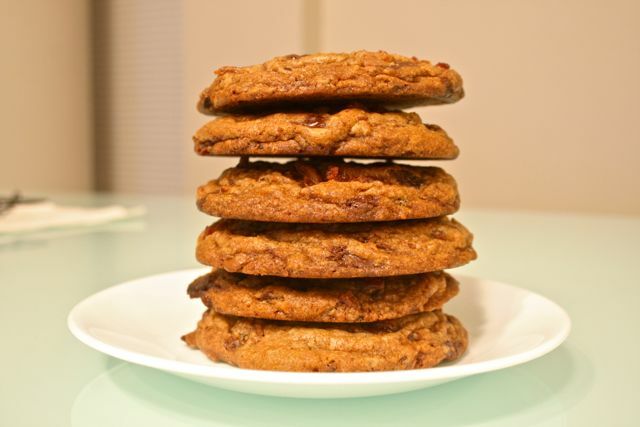 Just visiting from Food Bloggers Network and I couldn’t help but comment on your bacon chocolate chip cookies. I firmly believe that the addition of bacon improves almost every recipe. This looks wonderful! You have a new fan. Thanks so much, Stacy! I’m so happy to be a part of the group. And I totally agree with you on the bacon (obviously!). Wow, these look amazing!!! I have friends who love bacon, so I’ll definitely have to make these sometime for them! You’ll be happy that you did! 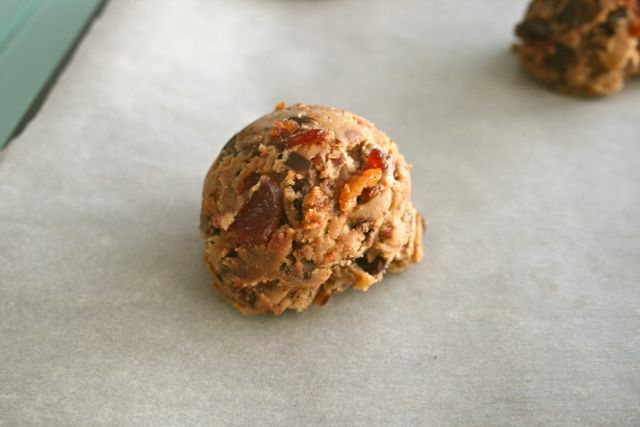 Even if you don’t make the cookie, you should definitely candy bacon. It is so damn good! 2. Those who live to eat. You clearly belong in the second group. Love your creativity! !